An art sale fundraiser for Maine Media Workshops + College. “This summer our friends, local artists, and community members will gather in Rockport to celebrate the spirit of creative collaboration that is at the heart of everything we do. Originally enjoyed as a parlor game by French Surrealists in the early 1920s, exquisite corpse is a collaborative artistic process that celebrates the unexpected. In most forms of the game, only a portion of what one artist has created is visible to the others, resulting in unusual, surprising, and unpredictably kinetic creations. We have invited our own community of world-renowned artists to collaborate with each other and with other local artists representing a diverse range of visual arts. These unique works of art will be sold at the event, where our guests will also enjoy the premiere of an Exquisite Corpse film created by special friends of our film program, as well as the limited edition release of our Exquisite Corpse book, created by more than 120 of our instructors and alumni. CRMS / Japan Student Exchange program. 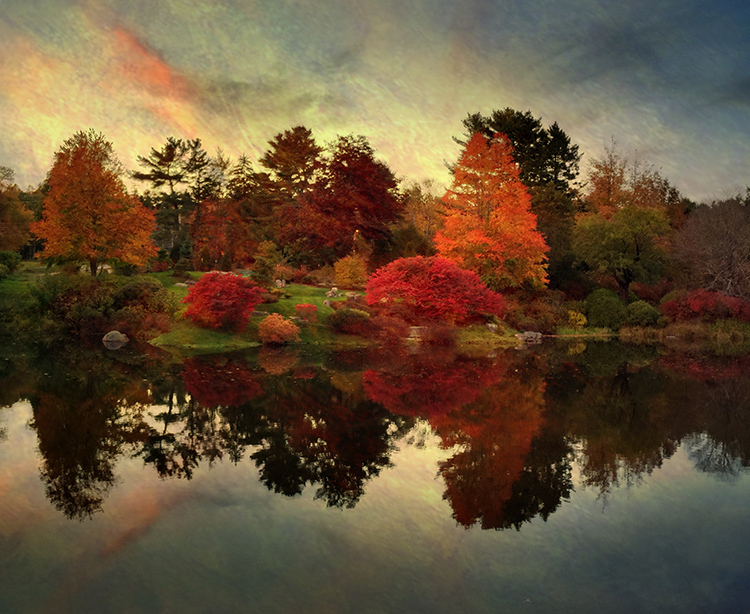 This fine art print by John Paul Caponigro portrays autumn colors at Asticou Gardens in Northeast Harbor, Maine. Asticou Gardens is styled after a Japanese stroll garden with many traditional Japanese design features elegantly blended with the natural setting and vegetation of coastal Maine. Much like this exchange program, it is a seamless fusion of Maine and Japan. Each fine art print is printed on an 8.5×11 inch sheet of coated archival rag paper using pigmented ink. The image area is approximately 6×7 inches, surrounded by a white border, numbered, and signed by the artist. For information about alternate sizes or further shipping options please contact us at jpc@johnpaulcaponigro.com.